Now that my husband and I are eating healthier I’m always on the lookout for nutrious snack ideas. Or, in other words, snack alternatives that won’t break the calorie bank. I admit it, I love snacks. Unfortunately I used to come home from work ravished, and eat snacks as I cooked dinner. I would eat potato chips and any other crunchy foods I could find in the kitchen. Some people crave sweet, some crave salt, but when I want a snack I’m looking for foods that pack a CRUNCH. I think the majority of my problem stemmed from eating foods that didn’t satisfy my hunger. I find it crazy that eating something as small as a hardboiled egg can curb hunger. One hard boiled can contain as much as 6.5 grams of protein. That’s what satisfies your hunger! After experiencing this first hand, I now look for protein in my snacks. I keep healthy snacks on hand (granola bars, nuts, etc) at work so I didn’t fall into the common vending machine trap. It just so happens that the below recipe will become one of my new snacks to have on hand. When I stumbled across the recipe I thought what a great idea! Greek yogurt is packed with protein (approximately10-15 grams per container) and blueberries have their own great health benefits. This recipe was definitely worth a try. 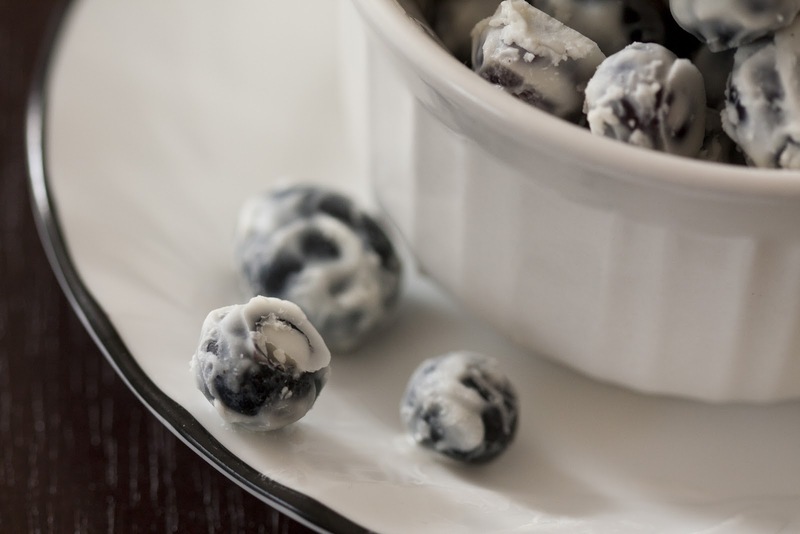 I almost didn’t make it, however, as the original recipe calls for using a toothpick to hand dip each blueberry in the yogurt. NO THANK YOU. I knew that would take forever and my patience would run short. Instead I figured out the perfect combination of blueberries and yogurt. That way, all that’s needed is to stir the two ingredients together and spread them onto a baking pan. No toothpicks needed! These came out great. The honey flavored Greek yogurt adds a nice subtle flavor and while the frozen berries provide a slight ‘crunch’ (perfect for me!). 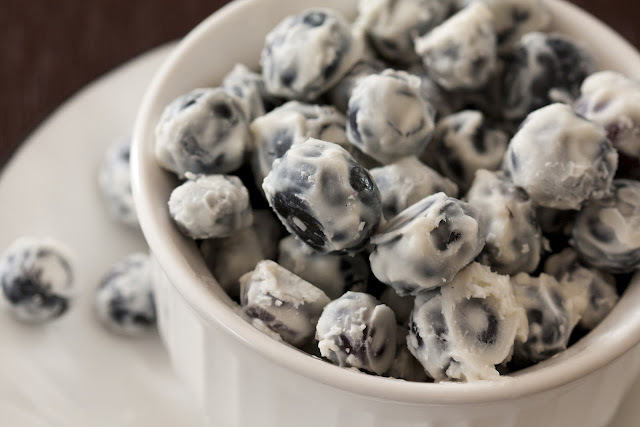 These would make a great snack on a hot summer day! I’ve found that storing the berries in a re-sealable bag, in the freezer, makes for an easy snack to grab while you’re on the run. Just a grab a few and enjoy! Place yogurt in a medium bowl and add blueberries. 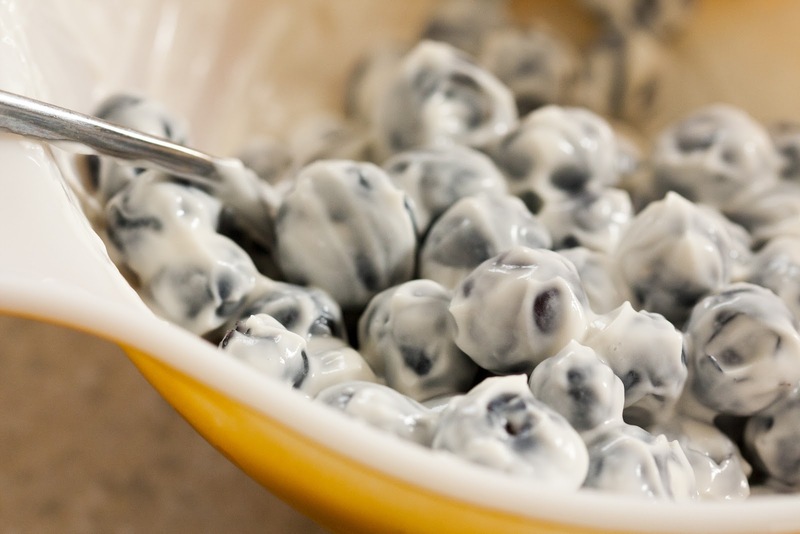 Gently use a spoon to stir and coat the blueberries with yogurt. 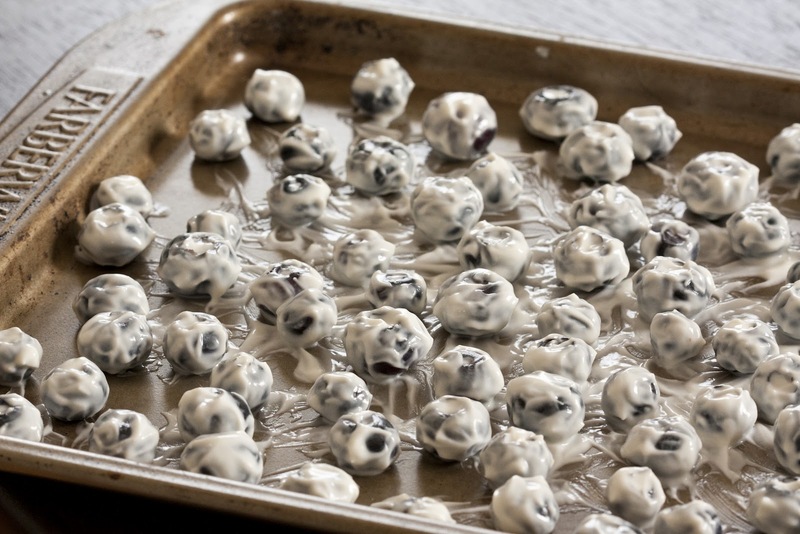 Pour yogurt covered blueberries onto a baking sheet. Separate the blueberries so that they do not touch. Place baking sheet in the freezer and allow to freeze for 1 hour. 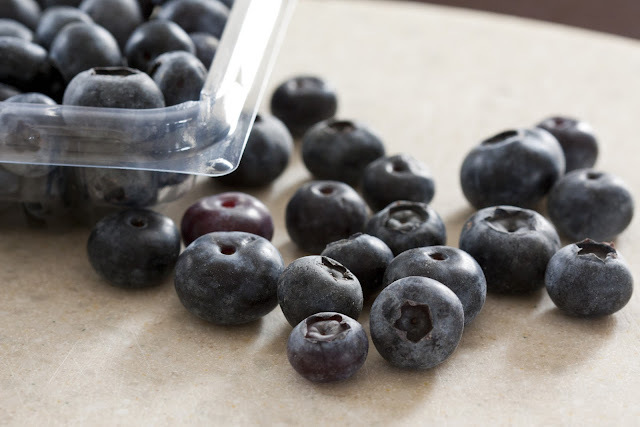 After frozen, remove blueberries from the baking sheet. Add to a re-sealable bag and place in the freezer. With the holiday right around the corner there’s no doubt that you or someone in your family will be dying Easter eggs. When I was younger my dad and I would dye a few dozen. The question is what do you do with that many eggs when Easter is over? Hard boiled eggs are great paired with breakfast or they can also serve as a nice protein snack (averaging 6 grams). 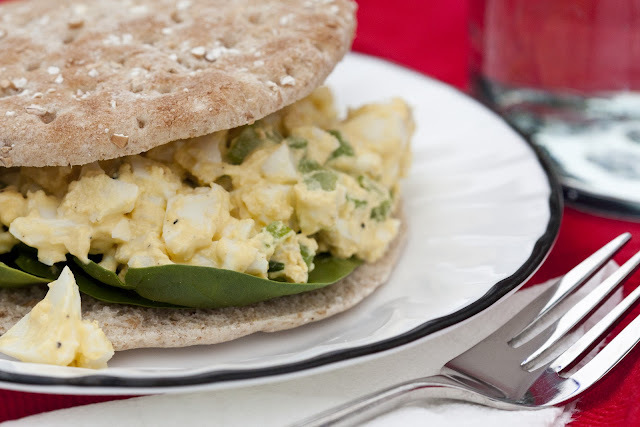 If you’re like me and would tire of eating an egg each day, then make egg salad sandwiches! I used to love when my mom would pack this sandwich for me in my school lunch. Now, looking back, I think there was probably a good amount of mayo that was added to make them so creamy. That’s why I thought I’d re-create this nostalgic sandwich but make a healthier version. Instead of using mayo, I replaced it with Greek yogurt. Greek yogurt is very thick and has a rich, creamy consistency. Not to mention it’s packed with a good amount of protein. Keep in mind substituting Greek yogurt for mayo can easily be done with various dishes (ex: chicken salad sandwiches) and provide the same tasty result without the guilt. Also, I have a huge time saving tip if you do not have left over Easter eggs. Did you know that you can buy hard boiled eggs in the store?! You can! And the best part is they’re already peeled!!!! They’re by Eggland’s Best and are kept near the fresh eggs. I know you might be thinking that’s a rip off as hard boiled eggs are so easy to make. But are they? Think about how much time is spent boiling and peeling them. I HATE peeling the shells. Even if you think you’ve fully de-shelled them, there’s always (ALWAYS!) a tiny bit of shell that remains and manages to make its way into the mix. AND with these eggs, they’re cooked perfectly. The yolk is never under or over cooked. It’s a perfect golden yellow. I can honestly say I will never make hard boiled eggs again. Buying them is just too easy. They also come in a nice re-sealable bag that allows us to store them in refrigerator and quickly grab a snack when we’re on the go. These egg salad sandwiches came out great. The spices included were not overpowering and next time I’d like to experiment with adding a little more mustard or perhaps some dill as well. This salad tastes amazing on toasted bread. Instead of using regular sandwich bread I decided to try Pepperidge Farm Deli Flats. They’re a very thin roll that’s perfect for sandwiches. The best part is they’re only 100 calories! They taste delicious and provide more support (no more falling apart!) for heavier sandwiches. We enjoyed topping our sandwiches with fresh spinach, but if you don’t like spinach, try topping yours with lettuce or tomatoes. Enjoy! In a large mixing bowl, combine first 7 ingredients; stir to combine well. Slice hard boiled eggs into quarters; add to large mixing bowl. Using a fork combine all ingredients. Mash eggs to desired consistency. 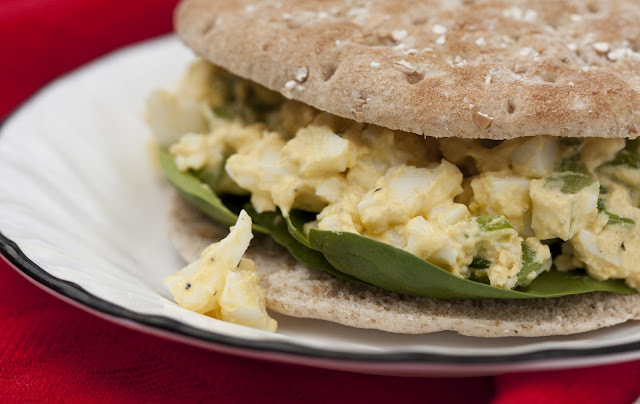 Assemble sandwich: place spinach on top of toasted bread, add egg salad on top of spinach, and top with toasted bread.